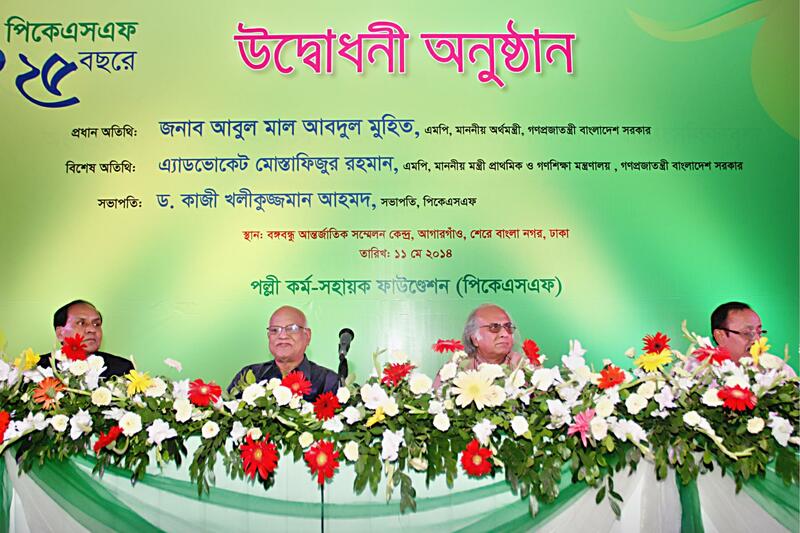 Sunday, May 11th: On the occasion of the beginning of PKSF’s 25th year, PKSF celebrated Silver Jubilee at the Bangabandhu International Conference Centre. The day-long event consisted of two parts: the inaugural ceremony of PKSF’s 25th year in the morning, and the ENRICH Conference in the afternoon. 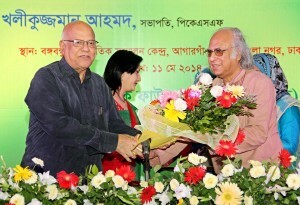 Dr Qazi Kholiquzzaman Ahmad, Chairman, PKSF presided over the day-long event. Mr. Md. Abdul Karim, Managing Director, PKSF was also present. 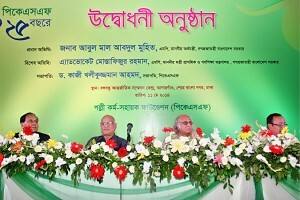 At the inaugural ceremony, Mr. Abul Maal Abdul Muhith, MP, Hon’ble Minister, Ministry of Finance, Government of the People’s Republic of Bangladesh was present as the Chief Guest and Advocate Mostafizur Rahman, MP, Hon’ble Minister, Ministry of Primary and Mass Education, Government of the People’s Republic of Bangladesh was the Special Guest. Members of PKSF’s Governing Body and General Body, PKSF’s Deputy Managing Directors, all PKSF officials and staff, and PKSF’s Pos with their staff came along to celebrate this joyful occasion. The ENRICH Conference in the latter part of the day showcased the success of PKSF’s flagship programme, ENRICH. The conference was attended by teachers and health volunteers of the ENRICH programme. They expressed their gratitude to PKSF for providing a platform for them to share their views. They also expressed their thoughts for the future development of ENRICH and shared encouraging words to continue ENRICH and PKSF’s endeavours.